Morocco’s constitutional reform in 2011 forms the basis of new laws and practices which increased civil participation in the decision-making process, but more remains to be done. How to strengthen the role of civil society organizations (CSOs) as “the cement between government and citizens”? This was one of the questions debated at the conference “Citizens and CSOs Inclusion in Decision-Making”, held in Skhirat, Morocco, by Counterpart International in partnership with five Moroccan CSOs (AMSED, Ennakhil, ALCI, Forum Ezzahrae and La Colombe Blanche). Morocco is on a path to further widening the space for civic engagement and civil society. Over the past seven years, the country has focused on the implementation of the right to citizens’ participation in decision making, as reflected in Morocco’s 2011 Constitution. Pushed by a royal concern for changing mentalities to move forward, Morocco’s government has developed an advanced regulatory framework, and created new tools for citizens to engage in decision making, according to Mustapha El Khalfi, Minister Delegate to the Head of Government for Relations with the Parliament and Civil Society, and Spokesman of the Government. Through the development of handbooks, reference guides and procedures; digital platforms like chikaya.ma; consultative regional councils; and training programmes the government has been supporting the roll-out of the country’s participatory democracy. A new hotline for citizen grievances for example has already received 15,000 calls, while a digital platform for submitting petitions, a right guaranteed by the 2011 constitutional reform, will be online soon. Some initiatives were successful, others not yet. Some authorities for example have disregarded a petition on the environment or refused to meet with CSOs. These examples show, according to the Minister, that reforms are also a matter of attitude and changing mentalities. Morocco historically has a strong culture of citizen participation. 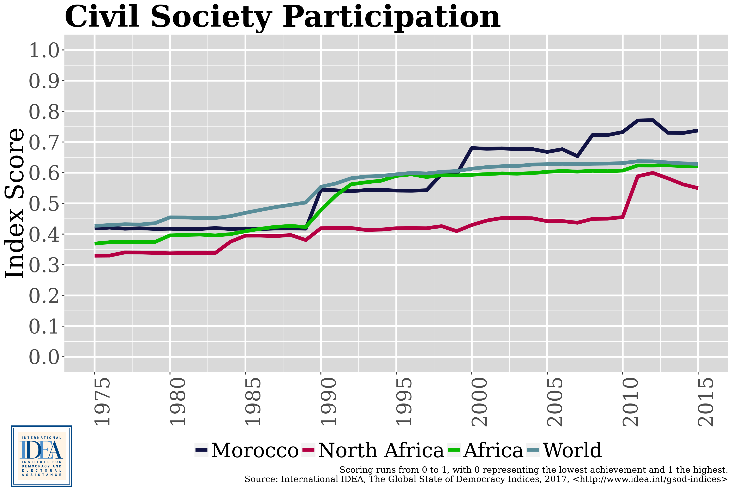 Since 1975, Morocco has seen an increase in its Civil Society Participation scores, outperforming the regional and global averages, according to International IDEA’s Global State of Democracy Indices. This positive trend does not mean that one can be complacent. Some members of the audience noted that the government tends to blow some successes out of proportion, claiming that not all handbooks are known by local councils and municipalities, and that the political will to support reforms is not always as strong as it should be. In the words of one critical female participant: “If you have an advanced law, but implement it with a backward mindset, you end up with a zero-sum game”. One of the challenges faced by both government agencies and CSOs is how to implement the regulatory framework throughout Morocco, a vast country divided in 16 regions which are subdivided in provinces or prefectures, and to include the voices of disadvantaged groups, especially those living in hard to reach, rural areas. Democratic institutions need to find ways to engage a broader group of citizens as “civic participation is for those who are currently not or unequally represented through representative democracy, regardless of the reason why”, according to one civil society activist. Women and youth especially need to be more involved, because CSO leadership in Morocco is dominated by an older generation, mostly men. —Ayman Ayoub, Deputy Head of the Middle East and North Africa Division at the Geneva Centre for Democratic Control of Armed Forces. Addressing these challenges requires capacity, resources and expertise. For regional and local governments to be able to write their development plans in collaboration with the public, would require 6,000 experts working 420 days, one speaker explained. The government alone does not have this capacity. However, with the support of CSOs they can better align development plans and policies with citizens priorities, and for example choose to invest in healthcare instead of a new road. Morocco’s participatory democracy is at an embryonic phase, but it has, in the words of one participant, ‘leapfrogged from confrontation to consultation’ which offers hope and potential for the years ahead. The next step is to bridge the gap between government and citizens priorities, between the national and local level and between law and practice. The country’s new participatory democracy framework offers a new paradigm and opportunity to further encourage civic dynamism and inclusion.